love the one that looks like has appliqued circles on it! I think I like your quilt or the gray one w/circles in blocks. Looks like a neat book! 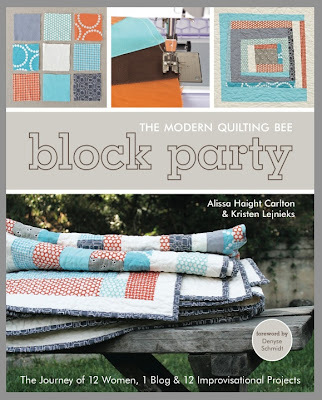 I love this book and would love a copy of it so my sisters and i could get ideas to plan our own block party!!! Just the greatest ideas. As a beginner, it is just so inspiring. I liked the stacked books one. It was hard to see them all, they flashed by so quickly. It would have been nice to have it slowed down or at least on screen for more than a milisecond on each quilt. i love all the quilts in this book. if i had to pick one, i think it would be ashleys kite quilt. this book is very inspirational. thank you! I am loving many many of these quilts, but the one that caught my eye for longest is the confetti looking one! I want to expand my 'MODERN' Quilting horizons and I think this book would help with that. Beautiful book. My favourite is this picnic one you have featured.Love the colours! I would love to win a copy of this book! It's on my amazon wishlist!! First I must say how very cool the video was on your blog!! My favorite quilt is the one with small random size blocks on the white background. Thanks for hosting the giveaway. I've taught a handful of friends at work to sew and would love to do some collaborative quilting. The book looks great! 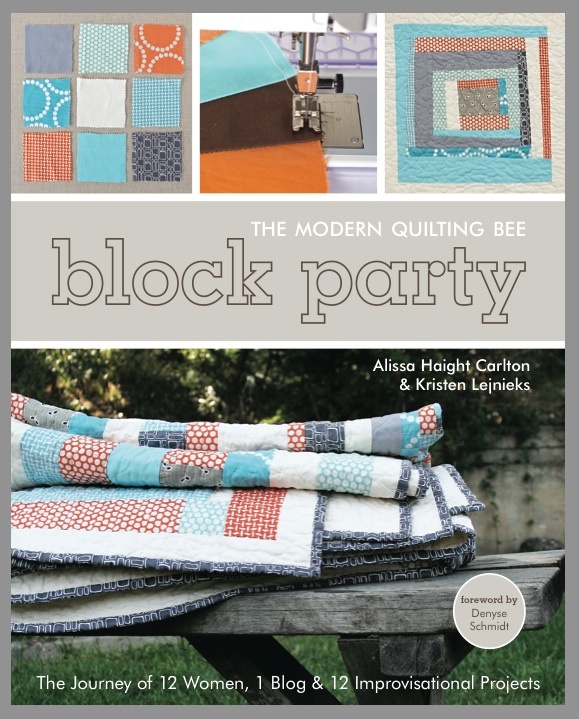 I'm starting at quilting, but love the idea of quilting bees and the modern and inspirational look of the quilts in this book, so I want one for me! I love the bright circles on dark. Thanks for the chance. It's really hard to pick just one. They are all my favorites. This is a wonderful book I'm adding to my wish list. 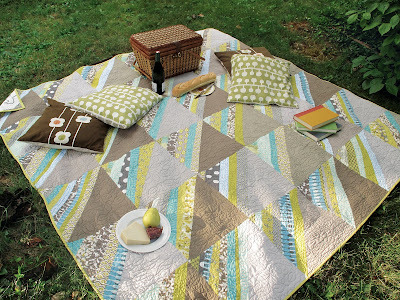 I haven't seen the book in person yet, but I am loving that picnic quilt you have pictured with the half solid and half strippy squares, the colors are just gorgeous. Wonderful book. I like the one pictured on a bed, white with small randomish squares. I have not seen all the quilts yet so I don't have a favorite yet...would love to win the book! I love the hexagon blocks, I am very interested in how best to promote creativity within a bee thanks for the giveaway! Love all the cool quilts...the hexagon is my favorite. Thanks for a chance to win! I really like the one that's half solid triangles and half strippy-pieced triangles. I love the one with the Circles and the gray background. But honestly, who am I kidding, they are all beautiful. I actually like yours the best! The combination of red and aqua is gorgeous, and the pops of intense red for background is genius! I would love to win a copy of this book! I think my favorite quilt are the X's or Roman stripes. Thank you for the chance! I love this. My favorite is the hexagon quilt. Not your ordinary Grandmothers Flower quilt! :) Thanks for the video tour (haven't seen it yet but the book is on my list!) And thanks for the chance to win! I love the stripy half-square triangle quilt. I may need to try that at some point... Thanks for doing the giveaway! I love profit margin and the hexagon one is kind of cool too. Since I'm new to quilting ~ I love them all and can hardly pick a favorite. The books sounds amazing. 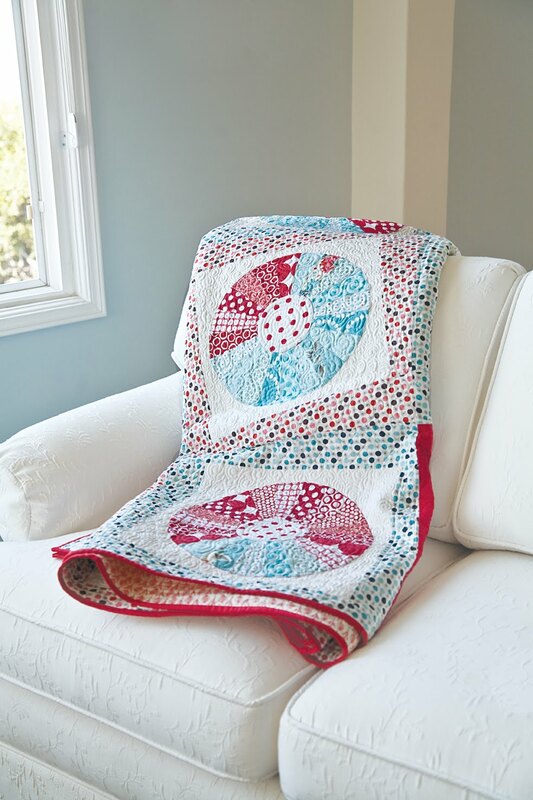 I think the quilt in the red/white/light blue color scheme with circles and all the polka dot material is gorgeous and is the one that intrigues me the most. Thanks for the chance to win a book! Hmm...hard to choose a favorite, but I like the Dresden pattern - would love to learn how to make that! Great video! Wonderful promo for all those great quilts. I love the fresh take on the hexagons/Grandmother's Flower Garden. Your quilt in this book has to be one of my all-time faves. Ooh, I like the one in the second-to-last photo of your posting. Thanks for the giveaway! Wow, love them all but especially the white one with the specks of color! I really love your quilt! It's so polka dotty and fun! Super excited about this book. Loving these quilts. I just joined my first bee! I'm not up until next year, so I have a lot of time to plan what I'd like to do for my block. I'd love to draw inspiration from your book! 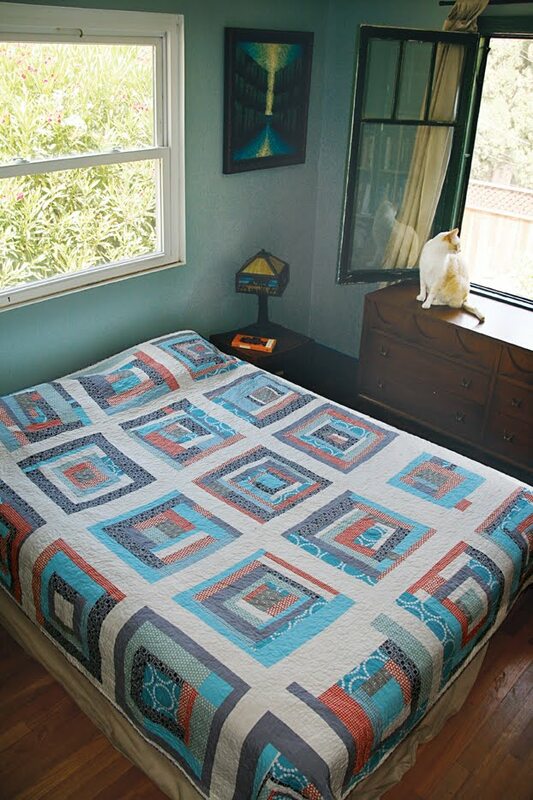 Circles and hexagons caught my eye, but I love the look of the diagonal lattice quilt, too! I don't think I can pick out a favorite quilt from the book yet but I love the whole idea of a traditional concept like a quilting bee and making it work in so many wonderful modern ways. I love your quilt, Profit Margins, though I didn't see a single quilt in the video that I didn't like! I'd love a copy to read more about how virtual quilt bees are structured. Thanks for the giveaway! I would love this book! I don't own any quilting books (which is crazy! ), so I definitely need to start building up my library of them. All of the quilts look so beautiful, but I especially love the dresden plate one. I love the one pictured on a wooden bench, the colours, and the shapes remind me of sails. Mind you they are all gorgeous. I hate to seem like I'm flattering you but I LOVE your quilt!! It made my heart skip a beat (and got itself pinned on pinterest). I also LOVE the selvage quilt. sigh. They're all so beautiful and different that it's hard to choose! So many fun quilts to look at for inspiration. What a fun book! You should be so proud - what a wonderful accomplishment! I would love to win this book. Congratulations! There are a bunch in there that I like, but I think the first one I would attempt would have to be the big, strippy X one. Thanks for the chance to win this book! I would love to have a copy of this book! How great to have all these great modern quilt patterns at my fingertips for inspiration and guidance! Thanks for the opportunity. wow that picnic quilt is just so lovely! Yes...the stacked books quilt is the best! I hope I win, pretty please. I have been thinking about joining a quilting bee and would love to win this inspirational book! I like connect the dots, awesome! Thanks for such a fun book. This book looks wonderful! I'd love to win a copy because I've just joined my very first quilting bee, also a virtual bee on Flickr, and I'd love to hear the inside stories of a bee like mine! I like the one with circles pieced in turquoise and red. And I would love to win this book.